God: helps. shields. loves. We: wait. rejoice. trust. hope. How often do we overlook our own responsibilities and take on God’s? Just because we disagree and have been on opposite sides of a battle doesn’t mean we toss honesty, humility, peace, reconciliation, and forgiveness to the side. Winning at any and all costs is not winning. We don’t have to wait until the end of our lives. In fact, we shouldn’t. Why waste time? Choose to be honest, humble, peaceful, conciliatory, and forgiving. Today. I Can Do All Things. So Can You. I don’t do everything well. There are some things I will never try to do. Some things I attempt result in what looks like failure, but my attempt might be the whole point and, therefore, the reason to celebrate. I rarely say “I can’t.” But I also don’t believe I am powerful, talented, or wise enough to be able to do anything and everything. I may not say “I can’t,” but I say “I shouldn’t” when I know an option I have isn’t the option I should take. I say “I can,” but only when I trust God to give me the power, talent, or wisdom I need to proceed. Not because He promises a specific outcome but because He promises His guidance and provision through the process. The process of trusting Him is much more important than an expected result. I don’t ask Him to rubber stamp the things I want to do. “All things” isn’t my determination. It is His. I can follow Him well. I can trust Him. Ask Him what the next thing is, then let Him strengthen you through it. We don’t always accept Jesus’ power, especially when things don’t go the way we want, when we feel out of control. We don’t want to accept His power, because it doesn’t make sense to us, and it’s something we can’t control. But it is something we have when we yield to Him. We let it work in and through us. And it is powerful. 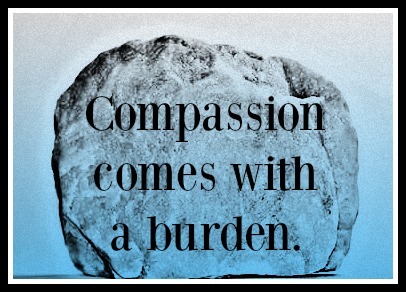 Compassion comes with a burden. We don’t always feel the burden. Sometimes our enthusiasm and joy with serving and showing compassion overrides the feelings of burden. But sometimes we have compassion and feel helpless, because we’re not sure what to do. Perhaps we’re not supposed to do anything in terms of fixing the problem. Showing compassion is sometimes simply sitting alongside and being available. It still feels helpless at times. However, we are never helpless in our compassion, because compassion is rooted in God and infused with His help. He is the source of compassion, and He is powerful and wise enough to know how it can and should be fulfilled. We just have to accept the help God gives instead of trying to own and control all the help. We have to yield even when the approach isn’t what we would choose. We need to trust Him. The burden of compassion is ultimately God’s. He loves people way more than we can even imagine loving people. Plus, He has the power to do something about it. He’s inviting you to help by seeking and trusting Him.